Make red, white and blue pennants with stars and stripes, then string them together to create a banner. 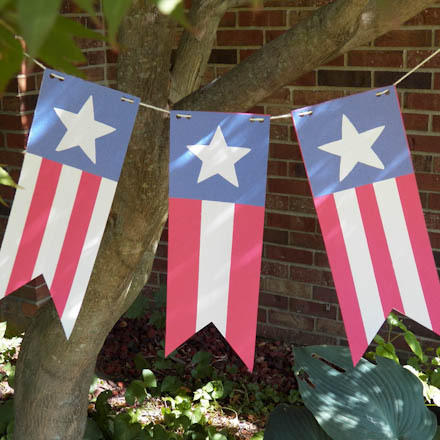 The banner can be used to decorate inside or outside for Memorial Day, the 4th of July, or anytime you have a patriotic theme party. This project requires few materials and is great for family, classroom or group craft time. With a little advance preparation by the adult or teen leaders, this project is easy, fast and fun. 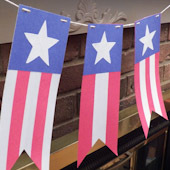 Related craft: Make a garland of red, white and blue stars! 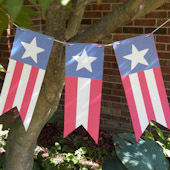 See the Patriotic Star Garland project for complete instructions. Pre-cut paper blanks from standard-size (9" by 12") sheets of construction paper. Cut a red sheet of construction paper in half lengthwise (4½" by 12")—this makes two pennants. Cut the blue construction paper in half lengthwise, then cut each piece into thirds. You will have six 4½" by 4" pieces. These are the backgrounds for the stars. 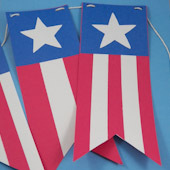 For the stripes and stars, cut the white construction paper in half the other direction to create two 6" by 9" pieces. If you like, go ahead and cut a 1½" by 9" strip and a 3" by 4" rectangle for the star. Or give the children the half sheet of white construction paper and let them cut their own pieces. Tip: If you want larger or smaller pennants, cut larger or smaller blanks, maintaining similar proportions. The pennant banners can have as many pennants as you like. For each pennant, fold a red pennant blank in half lengthwise. Cut on a diagonal from one corner toward the fold. Open the pennant and smooth the paper flat. Cut a star for each pennant (or two if both sides of the banner will be seen.) Cut the star from a 3" by 4" white rectangle, following the instructions for cutting stars in the Patriotic Star Garland project. Open the stars and smooth them flat. 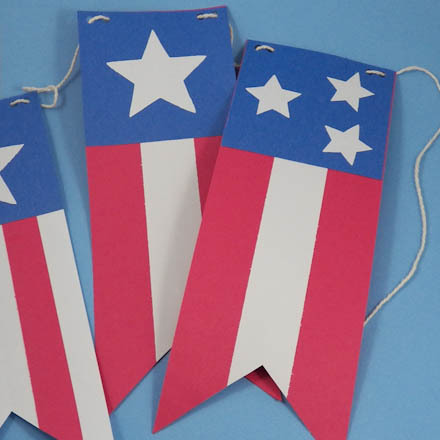 Tip: For young children or faster crafting, precut the stars or provide a traceable star template. Glue the white 1½" by 9" strip in the center of the pennant and trim ends that extend beyond the end of the pennant. Glue the blue 4½" by 4" rectangle at the top of the pennant and glue the star in the center of the blue. Tip: For a two-sided pennant, repeat on the other side. Punch four holes near the top of each pennant—two on each side. Cut a length of string or twine long enough for the number of pennants and where it will be hung—usually 4 to 8 feet (1 to 2 meters). Weave the string through the punched holes on the pennants (children may need help here). A blunt yarn needle can make the job go faster. Tip: Make more stripes by cutting 1"-wide white strips and gluing them in place to create five alternating red and white stripes. Tip: Make smaller stars by cutting stars from rectangles that are 1½" by 2" or use a star paper punch.